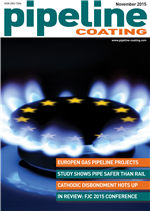 The November 2015 edition of Pipeline Coating is now available for viewing. Just click here to see the magazine in full, completely free of charge. Global industry news including Europe's planned Poland-Lithuania gas interconnector and Pakistan's Crescent adding pipe coating capacity. New product introductions for the pipe coating industry including handling systems, spreaders and epoxy curing additives.